Why are you doing this renovation project? The Royal Pavilion Estate is cherished by local people and is a destination for millions of visitors each year, contributing significantly to the local economy, but it can only be maintained for future generations with ongoing care and support. Since 2013, Brighton Dome & Brighton Festival, the Royal Pavilion & Museums, Brighton & Hove, and Brighton & Hove City Council have been working together on a plan to continue to protect and restore this rich heritage, starting with a major refurbishment of Brighton Dome Corn Exchange and Studio Theatre. By revitalising and reconnecting the historic estate at the heart of our city, we will be creating a world-class destination for heritage, culture and the performing arts infused with the vibrant spirit of Brighton past, present and future. What will happen if you don’t? Why do you need to do these works now? A sustainable future for the entire Estate will only be possible with significant investment. Whilst the buildings are magnificent, they are also facing unique challenges and are in need of restoration and upgrade in some areas. The garden also needs significant work to preserve and restore some areas and to tackle the issues of anti-social behaviour. A re-development project was originally undertaken between 1999 and 2002, which included the Brighton Museum & Art Gallery along with areas of the Brighton Dome Concert Hall and Corn Exchange. However, work principally focused on the main Concert Hall leaving the Studio Theatre and elements of the Corn Exchange relatively untouched. Artist and staff facilities, such as dressing rooms and offices in the Corn Exchange and Studio Theatre were not addressed and adequate on-site storage was unable to be found. More recently, it has become clear that the Grade I listed Corn Exchange is at risk due to limited funds to invest in repair and restoration. It is crucial we can ensure Brighton Dome remains adequately and safely equipped to present the dynamic and successful programme of events it attracts to the city centre. What are the key benefits of the project for Brighton & Hove? Combining an historic royal palace and Regency garden, a museum, art gallery and our three performing arts spaces, the Royal Pavilion Estate is the city’s cultural heart and the Royal Pavilion its internationally recognised emblem. The project will help secure the future of these unique historic assets, enabling more local people as well as visitors from around the world to enjoy them for generations to come. It will deliver improvements in accessibility, facilities and infrastructure and will benefit local residents, community groups, schools, artists, tourists, the regional digital community and local businesses amongst others. Why is the project being delivered in phases? The project is being delivered in a series of phases in response to a number of different funding opportunities. An initial bid to the Heritage Lottery Fund for match funding for the whole of the Royal Pavilion Estate project was unsuccessful, however the HLF Trustees were very supportive of the vision and were keen that we consider a phased approach to delivery of the project. This approach was adopted and proved successful with an award of just under £5m subsequently secured for Phase One, which joined £5.8m already pledged from Arts Council, England. How much will phase one cost? The total cost for Phase one is £21 million. The majority of funds towards the phase one costs have now been secured from a range of sources, including major contributions from National Lottery players via Arts Council England and the Heritage Lottery Fund, as well as commitments from a number of charitable trusts and individual donors and council capital funding. We will also be rolling out a series of fundraising initiatives which will include ways to support us digitally, a seat appeal and event activity. What will change in the Brighton Dome performance spaces as part of Phase One? This first phase of the project is a major refurbishment of the nationally important Corn Exchange and Studio Theatre, alongside essential conservation work. The transformation of the Corn Exchange, formerly the Prince Regent’s Riding house, will reveal and restore stunning and previously hidden heritage features as well as providing extra increased capacity seating and an impressive new viewing gallery. 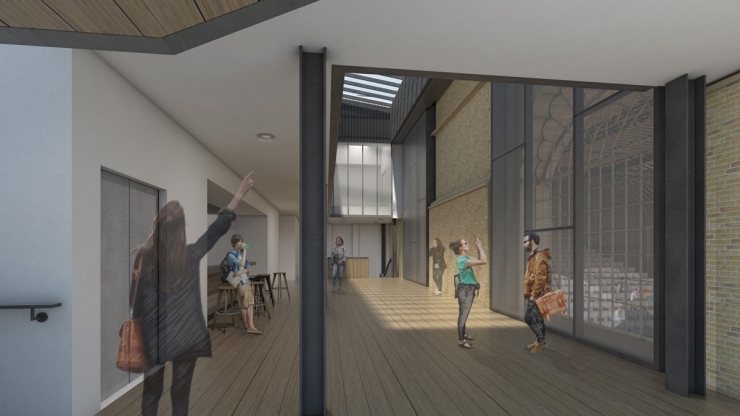 Major improvements to the Studio Theatre, once a stables and supper room, will include balcony seating, new bar facilities a new artists' creation space and a café opening out onto street level. Brighton Dome Concert Hall will remain open for business as usual throughout the redevelopment period. Having completed the initial development designs for the project, award-winning architects Feilden Clegg Bradley Studios (FCBStudios) were appointed in July 2015. Planning permission and listed building consent were granted for the Phase 1 works in November 2015. Preparatory works, consisting of essential maintenance, decoration and repairs as well some relocation of staff and technical equipment, began in autumn 2016 to help smooth the way for construction starting in the New Year. In January 2017 Britain's oldest and most established building company, R. Durtnell and Sons Limited, were appointed by Brighton & Hove City Council as contractors to start works on transforming the Grade 1 listed Brighton Dome Corn Exchange and Grade 2 listed Studio Theatre. Works began in February 2017. How long will Phase One take? The estimated completion date is autumn 2019. Works will be staged and Brighton Dome Concert Hall will remain open throughout the redevelopment. What would happen to the money secured so far if the project doesn’t go ahead? If the project doesn’t go ahead then the funding secured so far will be lost to the city altogether with no guarantee of those kinds of sums being available in the future. Will the refurbishment cause much disruption to your day-to-day activities? We will do our best to ensure that disruption during this time is minimal, but do refer to our webpage to see the latest changes affecting your visit. Will the Concert Hall remain open throughout? How can we support the project? Our Community Appeal is a chance for our audiences and visitors to help us to complete our fundraising target for the redevelopment.